In animals, there are two types of defenses against foreign invaders: specific and nonspecific. Specific immune responses can distinguish among different invaders. The response is different for each invader. With nonspecific defenses, the protection is always the same, no matter what the invader may be. Whereas only vertebrates have specific immune responses, all animals have some type of nonspecific defense. Examples of nonspecific defenses include physical barriers, protein defenses, cellular defenses, inflammation, and fever. One way for an organism to defend itself against invasion is through barriers that separate the organism from its environment. Physical barriers such as the skin and mucous membranes mechanically regulate what enters the body. Secretions provide protection at the barrier as well. Mucus, for example, can trap potential invaders. Also, skin secretions are slightly acidic , inhibiting bacterial growth. Many body secretions (such as mucus, tears, and saliva) contain an enzyme called lysozyme that destroys bacteria. There are proteins that protect the body nonspecifically. Complement proteins are found in the blood. When they bind to an invader, they stimulate inflammation, phagocytosis , and destruction of the invader's membrane. Although complement proteins may bind to an invader directly, they are most effective when they bind to antibodies that are attached to an invader. Antibodies are part of the body's specific immune response. Some immune cells and cells that are infected with viruses produce another set of proteins called interferons . Interferons send a warning to nearby cells. They help prevent infection by stimulating the production of antiviral proteins. Interferons also stimulate natural killer cells and macrophages. All animals have phagocytes that recognize and eliminate foreign invaders. For example, if a piece of one sponge is transplanted to a sponge from another colony, phagocytes in the sponges will attack and destroy each other. The same response can be observed in earthworms, arthropods , starfish, and all vertebrates. Scientist Elie Metchnikoff observed this process in starfish. 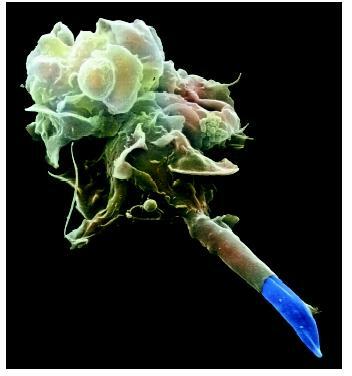 A colored scanning electron micrograph of a macrophage engulfing a parasite of the Leishmania genus. To defend the body, macrophages will surround a foreign invader, bring it inside the cell, then use enzymes to digest the material. In vertebrates, some phagocytes are also important in stimulating specific immune responses. Additionally, phagocytosis is stimulated when the invaders are coated with antibodies. Consequently, phagocytes (like complement proteins) represent an important link between nonspecific and specific immunity. Infection, mechanical force, chemicals, and extreme heat or cold can damage tissues, causing the nonspecific process of inflammation. The goal of inflammation is to clean up the damage and start the repair process. Inflammation begins when damaged tissues release chemical messengers such as histamine, prostaglandins , and leukotrienes. These chemicals cause nearby blood vessels to expand and become more leaky, allowing more blood flow to the damaged area. These chemicals also attract white blood cells (such as phagocytes) to the site to remove debris and foreign invaders. The results of these activities are easily observed when the skin is inflamed: swelling, redness, heat, and pain. Another nonspecific protection against infection is the development of a fever. Either the invader or the response to an invader causes a part of the brain called the hypothalamus to increase the body temperature. Fevers may increase body metabolism , speeding up the repair process. Fevers may also slow down the reproduction of some bacteria and viruses. Whether the mechanism is as complex as fever and inflammation or as simple as physical barriers and phagocytosis, all nonspecific defenses provide the body with general protection against foreign invaders. In 1882 a scientist named Elie Metchnikoff stuck a thorn into a starfish larva. He observed starfish cells trying to destroy the thorn. His discovery was an important step in understanding nonspecific defenses in animals. can you include more information about specific defense responses as well?